friends to enjoy it together, or binge-watch entire seasons of Orange Is The New Black on Netflix, the serial is an ubiquitous part of the way we enjoy fiction. In this course, we will return to the time and place in which serialized literature as we know it emerged: nineteenth-century Britain. or consume a piece of literature over time? Do we read and judge a serial differently from a completely published text? Who makes money off a serial, and does money matter to the way we read it? Who is writing it, and do we care to know? 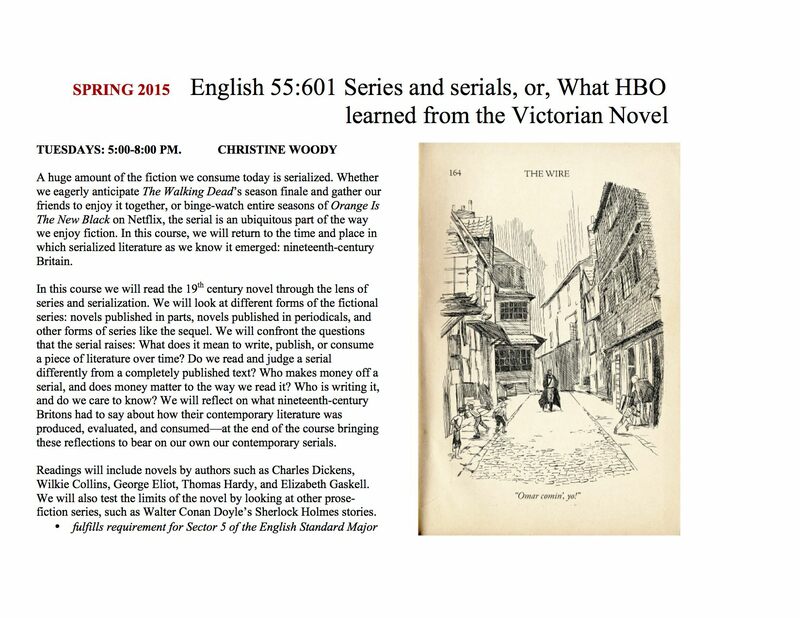 We will reflect on what nineteenth-century Britons had to say about how their contemporary literature was produced, evaluated, and consumed—at the end of the course bringing these reflections to bear on our own our contemporary serials. Readings will include novels by authors such as Charles Dickens, Wilkie Collins, George Eliot, Thomas Hardy, and Elizabeth Gaskell. We will also test the limits of the novel by looking at other prose-fiction series, such as Walter Conan Doyle’s Sherlock Holmes stories.